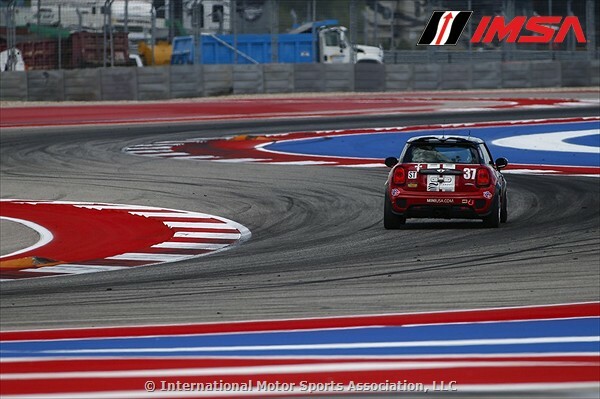 Round 9 of the Continental Tire SportsCar Challenge (CTSC) took place at the Circuit of the Americas (COTA). The Circuit of the Americas 150 had quite a few surprises, especially toward the end of the event. The race started out with a scary incident on lap one. The #65 BMW with Brent Mosing behind the wheel had a stuck throttle and went flying through a corner. He narrowly avoided hitting a car in the driver-side door and hit the wall hard. The good news is that he was able to walk away without injury from the event’s only full course caution. All three cars moved up the standings early in the race. Tyler Stone started the event in the #37 MINI JCW. Less than 15 minutes into the event he had moved up to 14th place from his starting position of 17th. The #52 had moved into 17th position with Ramin Abdolvahabi behind the wheel and the Derek Jones in the #73 was moving forward before an incident on the track. #73 struggling to regain control after contact from #18 Porsche. The #18 Porsche was looking to gain a position on Jones when he got aggressive. The #18 made strong contact with the rear bumper of Jones. As the #73 started to fish tail Jones showed excellent car control and managed to got a hold of his MINI just in front of teammate Stone. IMSA took notice of the incident and issued a drive-through penalty for the #18. Jones recovered from the contact nicely leading the trio of MINIs as they continued their march toward the front. An hour into the event Jones, Stone, and Abdolvahabi found themselves in 10th, 11th, and 14th respectively. A short time later pitstops would begin. The MINIs stayed out a little longer than some of their ST competitors. Jones and Stone were in the top 5 for a bit before coming in for their own stops. Mat Pombo replaced Jones in the #73. Nate Norenberg took over for Stone in the #37 and Mark Pombo stepped in for Abdolvahabi in the #52. All three would have some work to do if they wanted to get back toward the front of the field. As the race went on the cars became very spread out. This made it hard for anyone to gain positions. A much needed yellow to condense the field never arrived. What did happen was even more surprising. As the race wound down mechanical and fuel issues began to hit numerous cars. 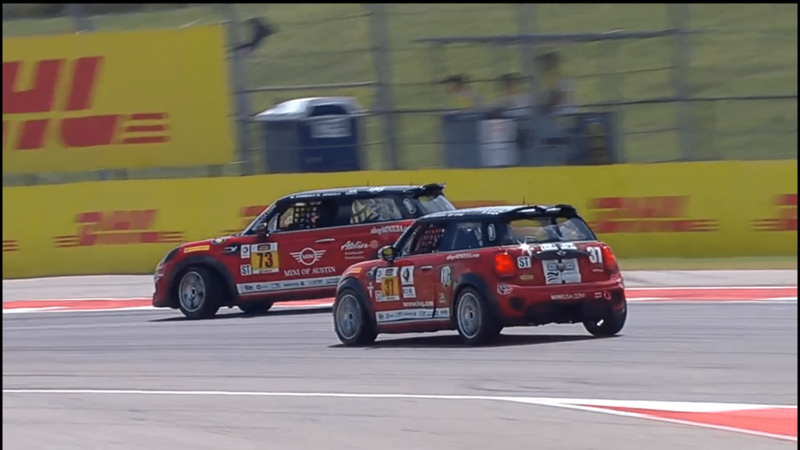 This was a fortunate scenario for the MINI JCW Team. All 3 JCWs had the fuel and reliability necessary to complete the event. One by one cars in front of them started to have issues. And as others faltered the MINIs continued to move up the grid. When the checkered flag waved it was excellent news for the team. They placed all 3 MINIs in the top 10, a first for the team! The #73 was the top finisher with a 6th place finish. The #52 came home in 9th followed by the #37 in 10th. While they may not have had the pace to contend for a podium at COTA, the team did have consistency. By keeping the cars clean and moving methodically forward the team walked away with a great result. Full MINI results below. Full field results can be found here. The 2016 season is coming to a close with only one race remaining. The #73 drivers are in contention for a top 5 points finish as they head to Road Atlanta. The good news is this is where they scored their best ever finish of second at last years race. It’s an event you definitely won’t want to miss. The Road Atlanta race takes place on October 1st. ← It’s Race Day at COTA!